Chuck your chopped peppers and onions onto a baking sheet, add your herbs and spices and pour a generous measure of olive oil over the vegetables. Give the vegetables a generous pinch of salt and black pepper and then get stuck in with your hands and mix up all the veg so everything’s coated in oil and herbs. In a 180 degree (celsius) oven, roast them for about 45 minutes, turning them once or twice, or roast them until they soften and brown slightly at the edges. Take them out and allow them to cool. 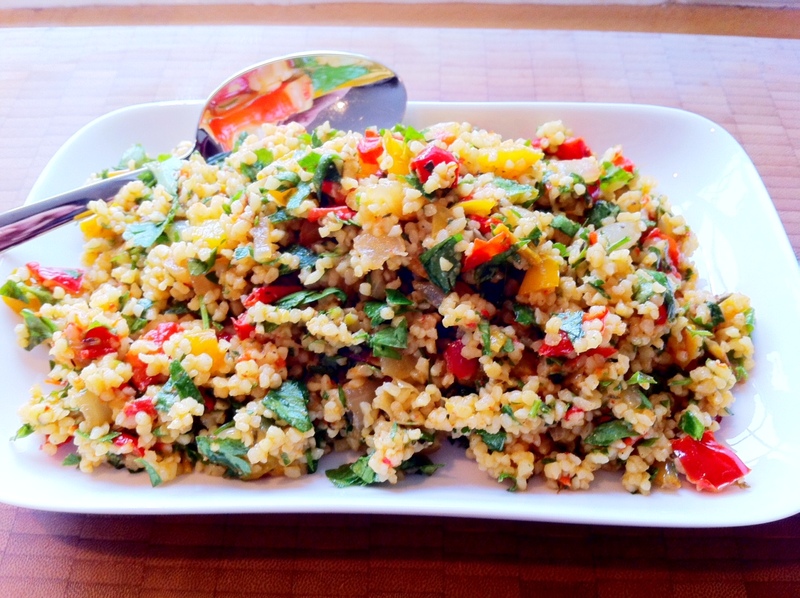 Add them (and use all of the juices/oil from the pan) and the chopped parsley to your cooked bulgar wheat and add 1 tablespoon of lemon juice, salt and pepper until you’re happy with the taste. I normally add at least 2 tablespoons of lemon juice because I love it tangy. There’s so many ways to jazz this up too – you could add some toasted nuts (like pine nuts or almonds) and/or add some chickpeas, beans or raisins/fruit to it as well.